No, I don’t mean nasty people I meet on my travels. I really mean the adorable, fluffy loyal animals. I love dogs immensely and sometimes love them more than certain people. I’ve been yearning to have a dog again but the lifestyle I have at the moment just isn’t suitable. And so whenever I travel, I either just happen to see a lot of dogs, or maybe I’m also actively seeking them out. These are Greenland Huskies (aka Greenland Dogs) that are used for sleds and to hunt polar bears and seals. 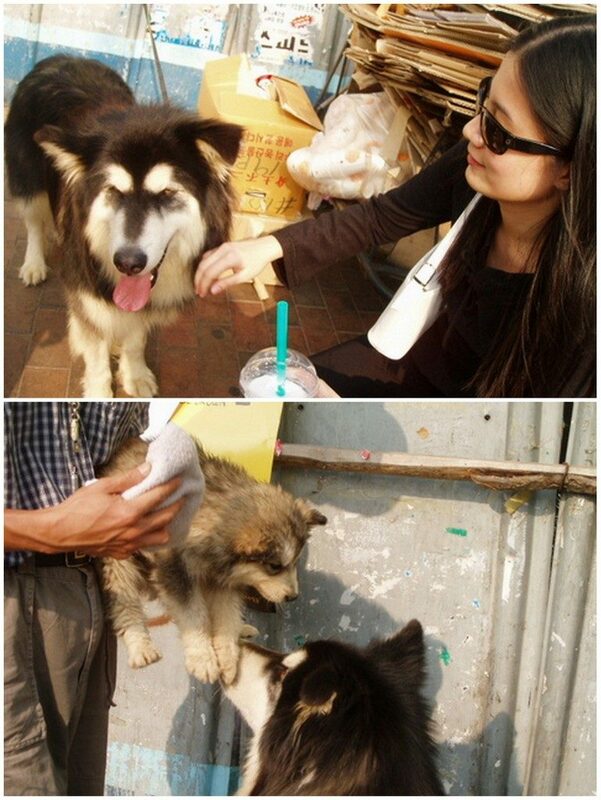 These dogs have a larger than life personality and need a firm hand and owner. I could tell that it is in these huskies’ blood to work. They were all in an enclosure and happily quiet / minding their own business. Soon as the sled was dragged out within their view… the air was filled with choruses of sharp barks and howls. Each and every dog was jumping up and down in their cage, tails wagging furiously, all wanting to be picked for the ride. I had a real good time getting muddy and playing with these huskies. View the entire dog-sled experience in Iceland here. Post Note: How could I forget to mention! To add to their resume, some of these huskies also starred in David Guetta’s “She Wolf” music video. These dogs have done more jobs and are more successful than some humans I know! This scruffy fellow reminds me of those photos and videos of how Japanese businessmen fall asleep in trains in seemingly awkward and painful angles. This dog was sound asleep as if his head was lying on the silkiest, fluffiest pillow instead of a cemented step. And this is in the busy, crowded steps of Santorini. 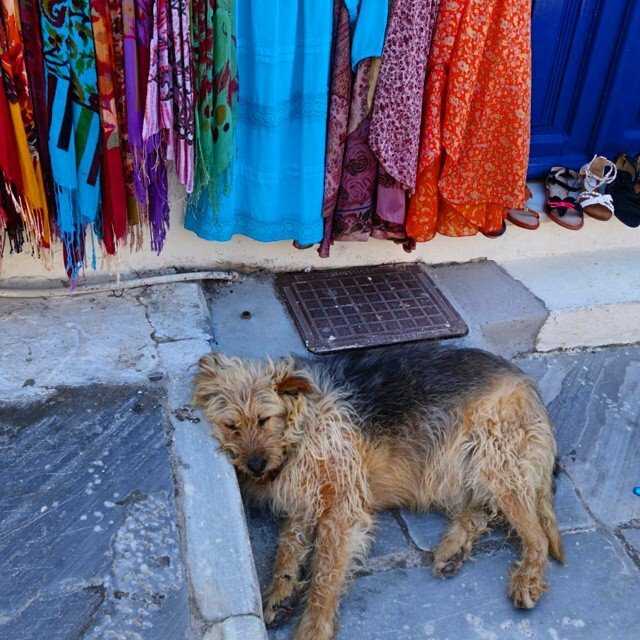 Tourists walk and trod past him, some barely missing a paw or his tail , but he remains blissful in his sleep. I met her when I was working in South Korea as a cabin crew. This was during one of my ‘rest days’ and my friend and I were exploring Seoul. Bubble milk teas were not so common or massive then. This man was selling the teas from a cart. I bought a drink and was pocketing my change when I heard a little yelp. It was the cutest pup I’ve seen in a while! The owner then showed me the mum, a black silky husky (I’m not too sure what breed this is) who had sharp light brown , almost yellow eyes. I petted the mother and though she let me, she was stoic and had her eyes and attention focused on the street. And only when the owner brought the pup to her did she show a sudden rush of emotion, immediately ditched her ‘duties’ for a while and nuzzled her pup with kisses. 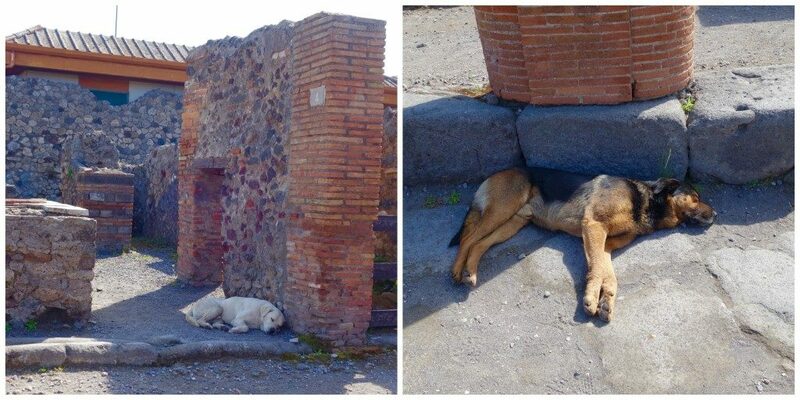 It was a hot day in Pompeii and as I was exploring the ruins, I saw four paws stick out from the main pedestrian road. It was the black and brown dog (right), happily asleep under the Naples sun, nevermind that there were a hundred tourists walking along the road he was at. As I started taking photographs of the sleeping dog, a man gestured to me wildly, asking me to come over. I narrowed my eyes in suspicion, but he just gesticulated even more urgently. (We both weren’t speaking the same language). Turns out all he wanted was to show me that there’s one more sleeping dog. I relaxed and gave him a knowing smile. A fellow dog lover! So we both look at this white dog (left) who I’d say was more clever in choosing a prime siesta spot. The man and I start taking photographs, and as happens in tourist areas, we are soon joined by curious folks who think we’ve spotted something wildly more interesting than 2 sleeping dogs. One teenager kept walking forward, craning his neck trying to follow our gaze still wondering what it was we were looking at. Then he accidentally stepped on the black / brown dog’s paw. The dog woke (just lifted his head), glared at the boy and promptly moved to where the white dog was, taking the other shaded column, and fell asleep once more. The uninhibited, unfazed beach boy, letting his balls hang loose and idly relaxing next to a bottle of San Miguel beer. 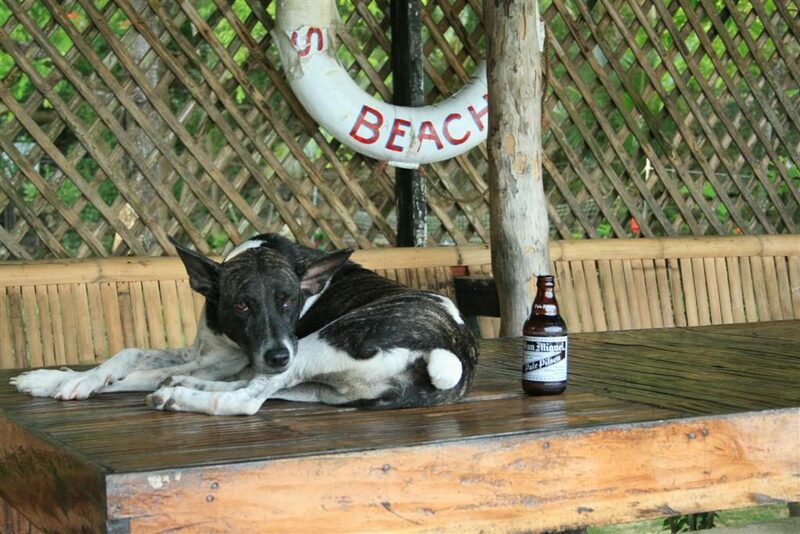 This dog was born and raised in the island / resort where I met him (Guimaras). Curiously enough, he’s not at all interested in food and would rather spend his days staring out into the sea. 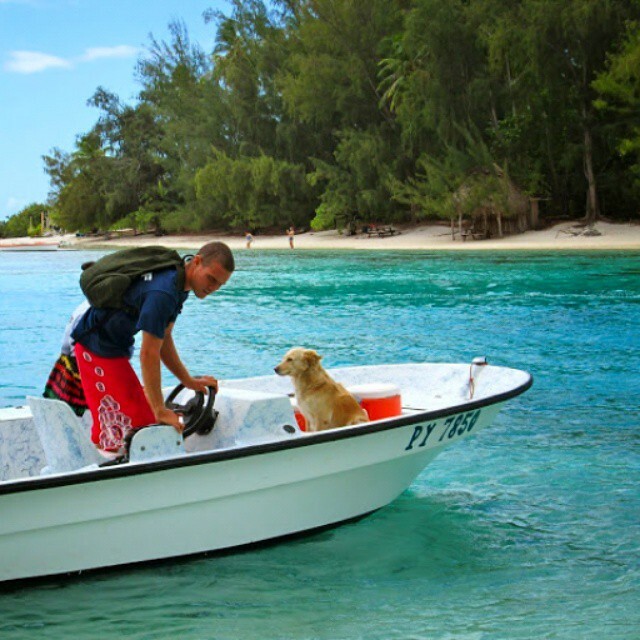 This dog and his owner provides lunch tours for a private island in Bora-Bora. He’s quite young but very attentive to his owner and extremely sharp. And though he frolicked and played with some tourists, he immediately went back to work when his owner called him as they started loading things back into their boat. One of the guides told me that it was usually the dog’s mother who did this task but this time, she was out on another lunch tour service. So this dog really did look as if he wanted to prove that he’s old enough to start real work. 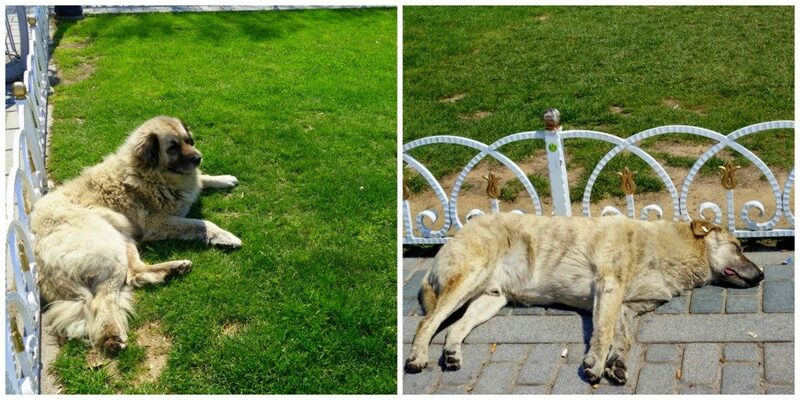 The dogs of Istanbul (that I’ve seen) have a wizened and gruff appearance. They are all tagged in the ears and have an oblivious attitude, relaxing or sleeping amidst the chaos of the tourists, locals, and the calls to prayer. They both have an air of a faded rockstar. Still very self-assured, but also indifferent to people. You can also tell they were once sprightly young dogs who prowled the streets of Istanbul with more vim and energy. I would love to give that dog in the left a makeover 🙂 And the sleeping dog, we’re both the same in that we look like a corpse when we sleep. There you go, just some of the dogs I’ve seen in my travels. Maybe one day I’ll be travelling with my own and I can stop stalking these poor buggers. Dogsledding in Iceland – Definitely a Holy Smithereens! Moment Movies That Inspired My Travels, Part 2! Movies that Inspired My Travels, Part 1 Miss Poehine: Tahiti’s Transgender Pageant The 2 Most Romantic Places I’d Ever Been to Travel Update: Where I’m Off to Next! What a super sweet post! I met a dog you have to add to your list the other day. Or should that be Dire Wolf? The puppies that starred as the Dire Wolves are all grown up now and come out to meet Game of Thrones fans in Ireland. They’re really big beautiful Northern Inuit dogs and such sweeties. One gave me a little kiss and I wish I could have brought them home. Though somehow i don’t think their owner (or the GOT fans) would let me get away with that! Hi, just wondering if you’re aware that the social share pop up buttons on your site render it unreadable on mobile? I love them all but the passed out businessman is my favourite! I’m desperate for a dog and take pictures of dogs wherever I go – I’ve even got my own Instagram hashtag #houndsinmyhood I think your international collection of canines are just adorable! Haha! Yes! The passed out businessman gets a vote 🙂 He is very adorable. Makes me want to swoop him in and treat him to a soft bed. I will check out #houndsinmyhood I’m glad I’m not the only one snapping away at random pooches. I absolutely love this. Dogs around the world. I agree with you – dogs are the best humans. What a fantastic post, Jean! The huskies are so amazing, but the apprentice dog in Bora-Bora is really attentive, love it. I am totally puppy obsessed, and since our Little Chef (Moodle puppy) arrived 6 weeks ago my social media is overflowing with dog stuff. Its brilliant! Your post is fabulous, although not entirely sure I would be getting that close to dogs I dont know.